I could tell you about the perfect quiet Christmas I had at home, stockings followed by church followed by delicious smoked salmon kedgeree brunch followed by presents followed by an exceedingly tasty and far too large turkey etc. followed by left-over trifle and Yule log from a Christmas Eve supper with friends. All snoozed off by an especially good Downton Abbey. Phew – ok I did tell you but I’m sure yours was just as good, and I don’t want to turn this blog into one of those show-off round robin letters you get at this time of year. You know, the ones which tell you everything is fantastic and little Fergus just got back from working with children in Tunisi-AH while Clementine expected to a first at Cambridge and oh, England is so frantic at Christmas so we’re all off skiing to Verbi-AH. Mum always wants to write the ‘alternative’ round robin i.e. darling Alexander has just come out of rehab, Toby’s teachers are optimistic he will pass at least one A-Level, and I’ve turned to drink, Merry Christmas! So, without being too smug about it, here are a few snapshots of my Christmas (when I wasn’t preoccupied with eating). A family heirloom, this one hundred year-old snowman certainly looks his age! Christmas is never the same without him perched on the cake - this year I gave him a star to fly on! the Brussels sauteed with chestnuts, bacon and sage awaiting the turkey. The other day some friends arrived with a great rib of sirloin beef from Waitrose (a sorry gift – their dog had grabbed a leg of cured ham off our dining room table and proceeded to munch through it all, while spreading the fatty remains all over the white carpet!). While the carpet was shot the beef almost made up for it as it was the best roast I’d ever eaten – very tender and full of flavour. By some miracle we had half left over and, while nothing beats a roast beef and chutney sandwich, I wanted to do something a bit more exotic and fresh. I therefore gathered up all the sad looking veg in the kitchen – a cauliflower, some wilting mange tout and the last of some little gem lettuce and put together a crunchy salad with thin slices of the still pink cold beef, noodles (plunged into cold water) and toasted sesame seeds. The dressing I used is the same oriental Vietnamese dressing I used before, as it’s sweet, sour and slightly spicy taste manages to make any raw or blanched vegetables taste delicious. Boiled cauliflower can be so dull so I par-boiled it then tossed it with olive oil, turmeric powder, salt and pepper and cooked it on a very hot griddle pan until it was charred all over. This gives it a slightly caramelised, bbq taste and was delicious when cool in the salad. You’d be forgiven for thinking that all I think about is food – this is partly true, but I equally spend a lot of time thinking about interior design and fashion. 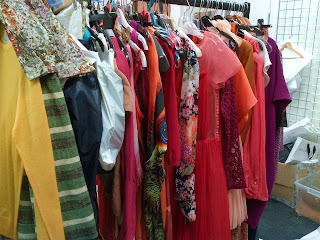 Recently I interned at mydeco.com and lately I’ve been tinkering around in The Times fashion cupboard as one of their interns (unpaid - very controversial at the moment, no comment - I digress), and aside from all the packing, unpacking, handling demanding PR's who 'need that $10,000 Oscar de la Renta dress (currently slumped on the fashion cupboard floor) back in NY NOW' and undignified sorting out of their look book cupboards - I have been knee deep in some very beautiful clothes. The fashion cupboard (or drawer if you compare its teeny tiny size to the enormous grandeur of The News International offices) is far from stylish with boxes, paper, plastic hangers peppered everywhere but among all the debris is a trove of accessories and buckets of the latest make-up stored in organised chaos. Naturalmente, my main dilemma was what to wear on my first day (and second and third and...) and I decided to play it safe with a new Whistles double leopard print blouse (I am poor, honestly) tucked into my trusty H&M navy trousers (£20 – see?!) and my Salvatore Ferragamo black pumps (which I got off Ebay and pinch like a crab but I love them), all finished with my gold charm bracelet and gold Accessorize chunky necklace. This fashion malarky is a bit too, well, fashion, for my liking but it was fun while it lasted - back to interior design and cooking for me! in the middle and in the Spring 2012 show below. Today starting with such a crisp frost and startling blue sky that it suddenly felt like Christmas was coming. This time last year we were deep in snow and what with the ghastly news at the moment and the strangely warm weather, I haven’t felt in a very festive mood. But, a spot of mince pie making and pulling out the first of the decorations brings with it the warm, nostalgic stirrings of the season. I don’t normally make mince pies (ahem, who needs to when you have Mr Kipling?!) but Gordon Ramsey did such a good PR job on his Claridge’s mince pie recipe that I couldn’t resist. And they are very good – different from Mr K’s as they have less pastry with a nutty, crumble topping for a lid. They're also smaller, which is fantastic if you (like me) think it’s only right that you have one every day leading up to Christmas! n.b. the mincemeat seems a bit of a palaver but is really easy once you’ve bought all the ingredients, I left mine in the fridge for 2-3 days and it tasted even better. 1 First, prepare the mincemeat. Place all the ingredients in a large bowl and stir well to mix. Cover with clingfilm and leave in a cool place for 2-3 hours – or preferably overnight – to allow the flavours to mingle and mature. At first, it may seem as if there is too much liquid in the mixture but, with time, the fruit will soak up the juices. 2 To make the pastry, sieve the flour, salt and icing sugar together, then tip into a food processor. Split the vanilla pod lengthways and scrape the seeds into the flour mixture. Add the diced butter and blend for a few seconds until the mixture resembles fine breadcrumbs. Tip the beaten eggs into the flour mixture and pulse again until the mixture comes together into a dough. Scrape the dough on to a lightly floured board and knead lightly for a few seconds – just long enough to get it smooth. (The less you handle the dough, the shorter and lighter it will be when baked.) Wrap with clingfilm and chill for 30 minutes while you prepare the topping. 3 Sift the flour and ground cinnamon into a large bowl. Add the butter and rub the ingredients with the tip of your fingers until they become coarse and crumbly. Mix in the sugar and hazelnuts. 4 Roll out the pastry on a lightly floured work surface to the thickness of a £1 coin. Cut out 12 x 8cm rounds with a plain or fluted pastry cutter and press into a 12-hole mince-pie tin. Re-roll the trimmings and repeat the process to line another two tins. 5 Neatly place a tablespoon of the mincemeat into each pastry shell and sprinkle with the crumble topping. Chill for 20 minutes while you preheat the oven to 190C/Gas 5. I've always been a pretty easy-going eater. I was never one of those children who refused point blank to eat their greens, in fact the only time I did refuse to eat my dinner (this was, and I vividly remember, a stew), my furious dad gave me the ultimatum – either eat or go to your room. I went to my room and this was probably more because I wanted to annoy him than not eat the stew! Now, as a grown adult(! ), the one thing I absolutely cannot eat is fresh coriander - the taste strangely repulses me! I have no idea why, but I have heard that other people have the same problem while many LOVE coriander. So maybe there is something in that. I really would love to at lease tolerate coriander, so, to challenge my taste buds, I decided to make this unthreatening chicken recipe by Sarah Raven which involves whizzing the herb into oblivion along with lots of spices for a marinade. I added some coconut rice which tones down the heat and some steamed Pak Choi to carry on the Eastern flavours. It’s a lovely, fresh, healthy recipe but the classic chicken and rice combination makes it wonderfully enveloping - perfect for the long dark evenings ahead. In a food processor, whizz together a large handful of Coriander, the juice of 1 Lime, 1 Garlic Clove, 3 Tbsp good olive oil, 1 Red Chilli (deseeded and finely chopped), a thumb-sized piece of fresh ginger (peeled and chopped), the seeds from 6 cardamom pods and a grind of salt and pepper. Chop 4 Chicken Breasts into bite size pieces and smear with the green mixture. Place in a baking dish and leave (covered) in the fridge for a minimum of 1 hour. Put the chicken pieces and all the marinade into a small casserole dish. Cover and place in the oven for 15 minutes, stirring halfway through the cooking time and adding 3-4 Tbsp Chicken Stock. Heat 2 Tbsp Vegetable Oil in a wok or large frying pan and stir-fry 5 Spring Onions, chopped, 1 fresh green Chilli, deseeded and chopped and 60g desiccated Coconut until lightly browned. Add 240g Jasmine Rice and fry for 2-3 minutes. Pour in 200ml Vegetable Stock and bring to the boil. Add 1x400ml tin Coconut milk and simmer for 10-15 minutes, until the rice is tender. Sorry blog for abandoning you! For the past few months I have been interning in London at mydeco.com (check out their great new website that I helped on!). This meant long hours, plus living with family friends (who cooked me delicious meals every night), plus using spare moments to apply for jobs, resulting in little time to cook or blog myself. But now that I am back ensconced in the countryside I can get cooking again and this weekend I got round to do some baking, namely some quick focaccia and the Raspberry Cheesecake Brownie from The Hummingbird Bakery cookbook which I’ve been wanting to make for a long time - although my topping is more fruits of the forest cream than raspberry cream. While in London I managed to go to some great restaurants (when my intern budget allowed!). Working in Notting Hill I discovered a newly opened deli called Menoo Eclectic Food on Kensington Church St which was Ottolenghi in style but cheaper and with a lovely relaxed atmosphere and friendly staff – their huge cheese stuffed risotto balls are delicious! I did a return visit to Polpo and it was just as good as last time. I also managed to get to Cambio de Tercio on the Brompton Road, as it had got a great review by Matthew Norman in the Telegraph. It was absolutely fantastic – the best Spanish food I’ve tasted, beautifully presented and with a friendly and relaxed atmosphere. But back to baking, and this Focaccia is the perfect bread to make when you want a lunch of cold meats, salads and cheeses to go that bit further. Although it is drizzled in olive oil, you can scatter it with lots of delicious roasted vegetables to keep it healthy rather than cheese-laden like a pizza. Focaccia with Basil, Slow-roasted Tomato and Parmesan. Firstly, slice 5-10 Large Vine Tomatoes in half and place on a baking tray lined with parchment. Season with sea salt, drizzle with oil and put in the oven at 120˚C for 3-4 hours (or until they look semi-dried). Make the dough by mixing together 250ml Water, 3 Tbsp Olive Oil, 1½ Tsp Sea Salt, 400g White Bread Flour and 2¼ Tsp Dried Yeast. When it has come together in a ball, knead for 5 minutes. You can do all this with a dough hook too. Place in a greased bowl and leave to rise in a warm place for an hour until it has doubled in size. Preheat the oven to 190˚C and lightly grease a 33 x 23cm baking tin. Chop up half the tomatoes. Knead the dough on a floured surface and add the chopped tomatoes, a small handful of chopped Basil and knead again to combine. Now stretch the dough out over the surface of the baking tray – you can be quite rough, the more rustic the better – and finish by sprinkling over more chopped basil and the other tomatoes. Drizzle over more olive oil and sprinkle with sea salt. Place a tray filled with ice cubes at the bottom of the oven and then the prepared dough on the shelf above (this creates a steam). Bake for 25minutes until golden.